Happy Wednesday! 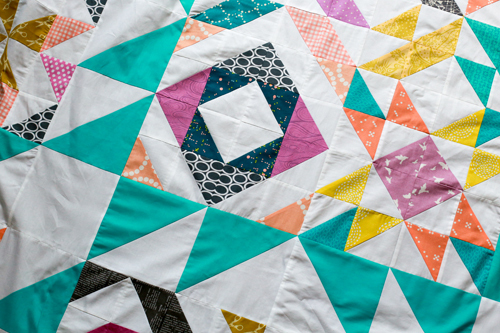 I'm excited to bring you the second installment of a series of quilt settings to accompany my book, Patchwork Essentials: The Half-Square Triangle. I wanted to share something that would be a good add-on to the 60 Block Chart included in the book! The blocks in that section can be used in many ways, including in the final chapter of quilts in the book. You can find the first setting tutorial here: Over and Above Quilt Setting Tutorial. 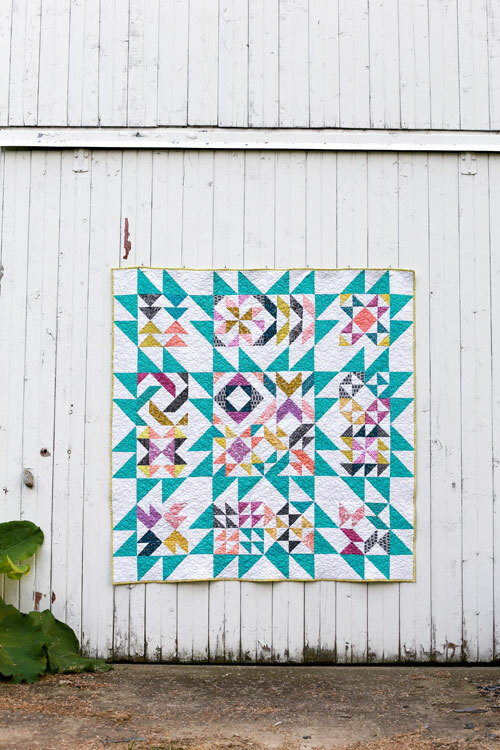 See this quilt finished here. 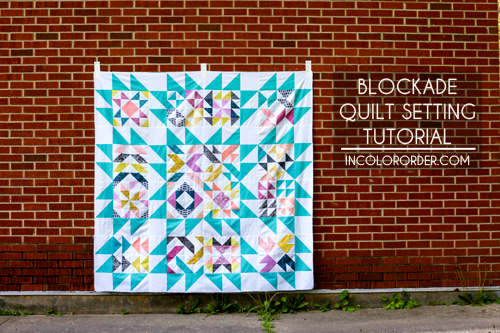 As I mentioned in the first tutorial, over the next few weeks/months I'll be sharing additional quilt settings (layouts!) 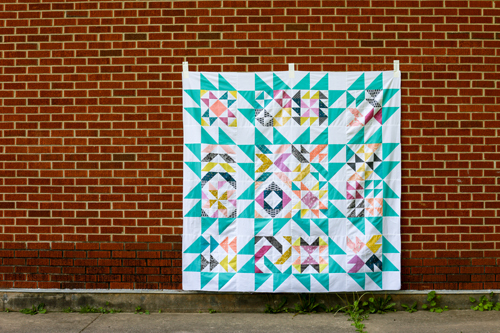 that you could use with the 60 blocks from the block chart in my book, blocks from my Simply Sampled or Half-Square Triangle Sampler patterns, or any 12" finished quilt blocks! The quilts will be different sizes, and take a different number of blocks. I'll be sharing instructions for the quilt setting only, not the blocks. I will however be sharing fabric requirements to help guide you on making the half-square triangle blocks from the book needed for each setting! 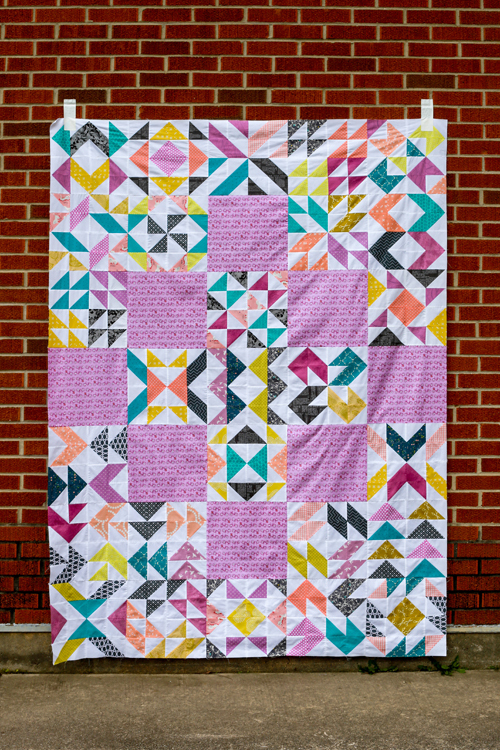 After such a warm response to my Blockade Mini Quilt that I designed for last month's Quilty Box, I super sized the design for this quilt setting! 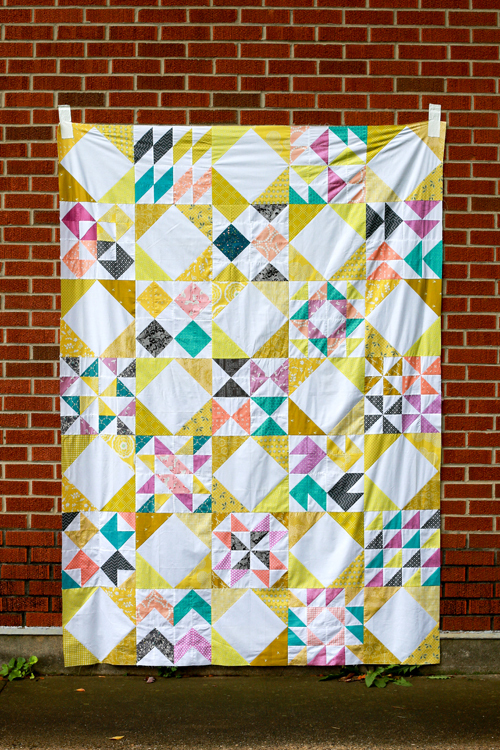 Thank you to those who chimed in about your favorite quilt sizes, I took that into account when sizing this quilt! Still need a copy of my book? Pick one up here! Fat Quarter = 18" x 21"
Cut print and background fabric into squares for 3" finished half-square triangles. Reference charts on pages 15-17 of Patchwork Essentials for cut square size and trimming information. 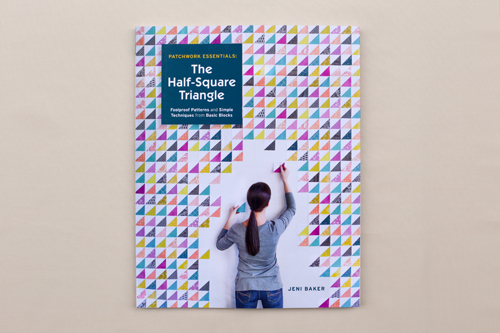 Make a total of 256 half-square triangles. 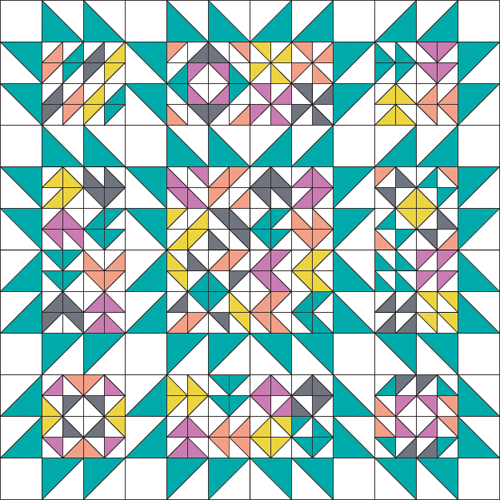 Sew half-square triangles into 16 blocks, use block chart on pages 85-99 for block layouts. 1. Using a marking pen, draw a diagonal line across the wrong side of 7” background squares. Place one 7” background square and one 7” accent square right sides together. Stitch 1/4" on both sides of the marked line. Press and cut apart on the marked line to create two half-square triangles. Press seams as desired. Repeat with remaining 7” squares. Trim half-square triangles to 6.5” square. 2. Arrange four half-square triangles created in step one, plus a 12.5" block and one 6.5" background square as shown in the block diagram. Sew elements together in each row, press seams open. Sew two rows together to complete block. Press seams open. 3. Arrange blocks using the diagram. 4. Sew blocks together in each row. Press seams in one direction, alternating direction every other row. 5. Sew rows together. Press seams open. 6. Cut backing yardage in half. Press. Trim off the selvedges and sew your pieces together lengthwise. Press seam open. 7. Basting: Using masking or painter’s tape, tape the backing to a clean, hard surface, right side down. Spread out your batting on top of the backing. Smooth out any wrinkles. Carefully spread out your quilt top on top of the batting, right side up. Pin your top, I like to use curved safety pins, spacing the pins a few inches apart. Make sure that your pins are going through all three layers. 8. Quilting: Quilt as desired, by machine or by hand. Trim away excess batting and backing fabric. 9. Binding: Trim off selvedges and sew your binding strips together to form one long strip, press seams open. Fold in half lengthwise, pressing with your iron as you fold. Attach binding using your preferred method. For a detailed tutorial on attaching your binding to both sides by machine, see here. Enjoy! 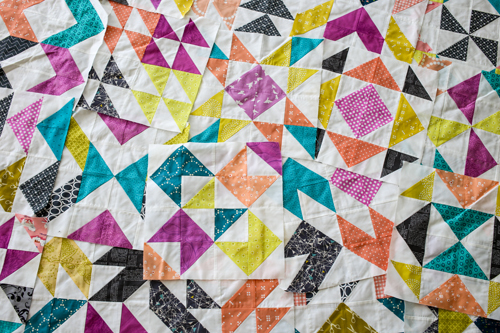 Share your progress and finished quilt photos using the #patchworkessentials hashtag on social media or add it to the In Color Order Flickr Group! Very nice Jeni! This is a great setting! Thank you for the tutorial. I love all of your ideas. This quilt makes me happy. Thank you for sharing your inspiration and mad skills. This looks a great layout. I received a copy of your book in the mail yesterday and can't wait to read it and start creating.